Most rotating bezels (like the Rolex Submariner's) track elapsed time starting at "0," while some count down to "0" from a particular point in time. Still others have a 12-hour GMT scale that can be used to display a foreign time zone in coordination with the existing hour hand, or a 24-hour GMT scale that can do so in coordination with a dedicated 24-hour hand. Question for the forum: Can you think of any bezels that combine two or more of these capabilities? 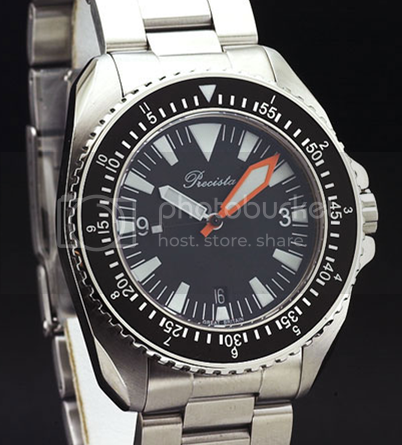 To illustrate, here is one from the Precista PRS-3 that features both a countdown bezel and a 12-hour GMT scale. In a pinch, the latter can serve double-duty as an elapsed-time readout.